Third time was the charm! Jody is out of the OR and now in the cardiovascular surgical intensive care unit (CVSICU), where he arrived at roughly 0345 this morning. Surgery was a success, but he is far from ‘out of the woods.’ He is currently sedated and a ventilator is doing all the work of breathing for him while his new lungs rest. There is hardly a square inch on his body that is not hooked up to a line, tube, or machine. They are, at this very moment, placing a thoracic epidural which will help to keep his pain under control and in turn improve his breathing (once he is doing it on his own). I am assured by the nursing team that Jody is right on target with where he needs to be in his recovery process. There is a long road ahead, especially for Jody. We covet your prayers. Praise God! Lots of love to you Jody! Many good wishes and prayers for you and your family. May God make you stronger every day. continue to keep you in our prayers throughout your recovery. Jody, the courage you’ve had in this process has shown me just how much God loves you/us. Although I haven’t known you long you were smiling ever time I saw you. I remember you were the first one to talk to me at the mens Friday morning bible study. You and your family have been showing how God works though all of this and I’m sure that you have touched many people in ways that you may never know. God has been using you in a might way. May you and your family recover quickly, keep that smile and continue letting people see God in you. Praising God for this miracle of new lungs for you Jody. You have always been such a strong advocate for your health and we know that God will continue to be right beside you on this journey. Prayers, blessings and love from the Crills family. It appears we have mutual friends on FB and found your blog post shared by those friends. 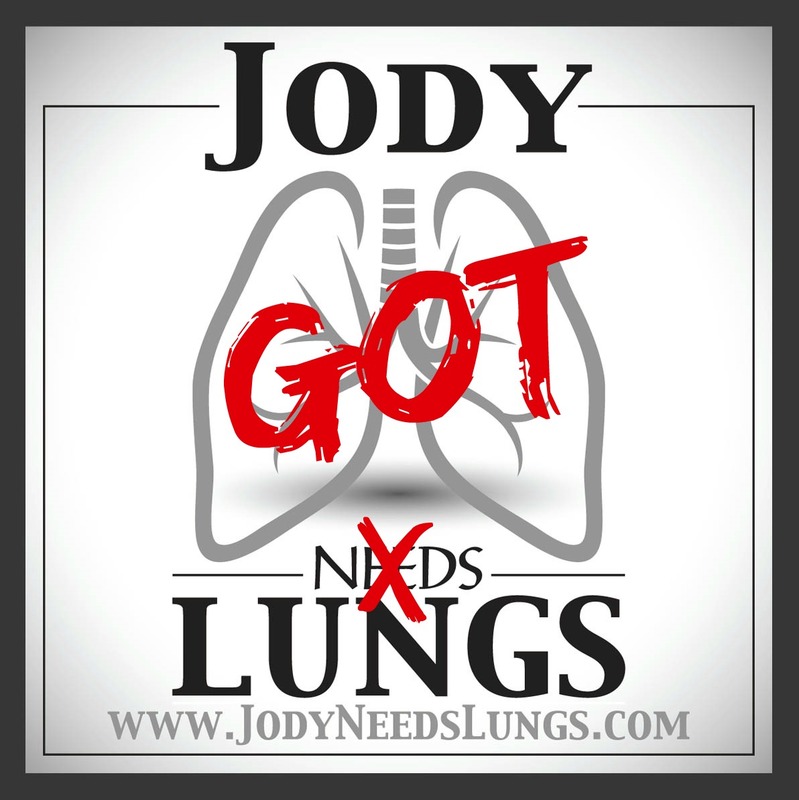 Having family members that have CF and also knowing what transplantation is about (I’m a transplant coordinator for Gift of Life) I will send prayers for healing of Jody’s body, his new lungs, to you and your family along with the donor family. What a rare gift you’ve been given, wishing you healthy, breathe easy days. Congratulations! I’m so happy for you. I’ve been following your blog for a few months, I think I started about the same time you got on the list. I got relisted for a second transplant in June but got put on hold because my pseudomonas flared up. They have yet to reactive me so I’m worried and feel like I’m in Limbo. I’ve been in chronic rejection for 2.5 years. I had my first transplant almost 6 years ago at 18 years old. I always feel like people who get theirs later in life are probably better off for some reason, that’s probably not true entirely true though. Trust me recovery will be tough, but you will get through it. We are all very strong having been through so much already. I hope you do great with you new lungs and your new life. Enjoy every moment! And be very wary of the side effects of prednisone! It will make you crazy so you will really have to watch your emotions. I’m new to your blog!! i’m so happy for you and your family. I live in Greencastle, Pa i’m 57 I have CF for 14 years. May GOD bless you and your family!! !